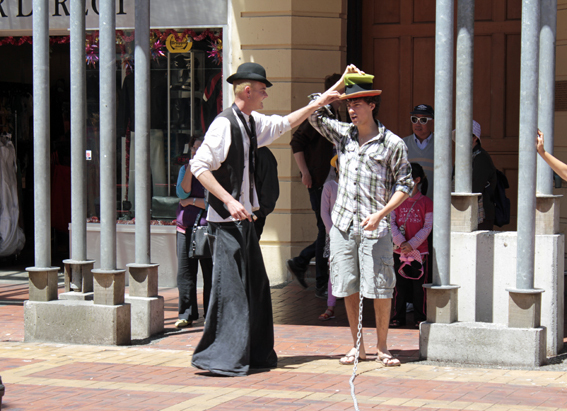 Change is the only constant at times and Cuba St has seen an awful lot in its time. 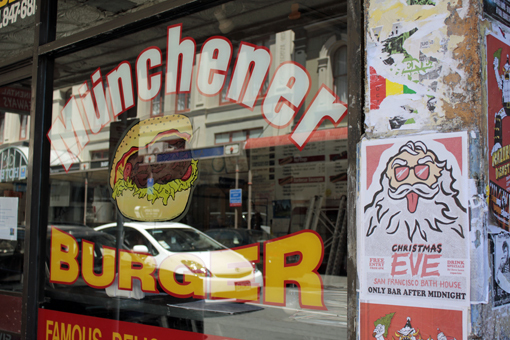 Ernesto café has closed, so has Muchener Burger another long standing Cuba St institution. I hear that Ernesto will be reopening in the vacated burger joints building after some renovations are completed. At least one of the locals is only moving not leaving. 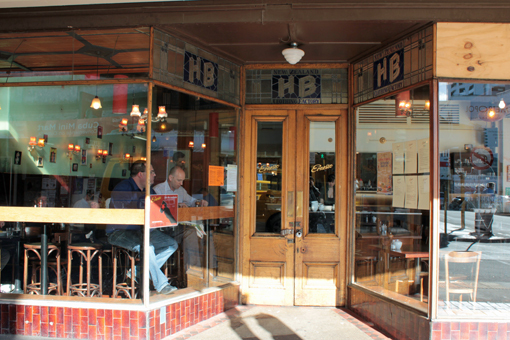 Ernesto was located in the HB clothing factory building on the corner of Cuba and Guzznee Street. 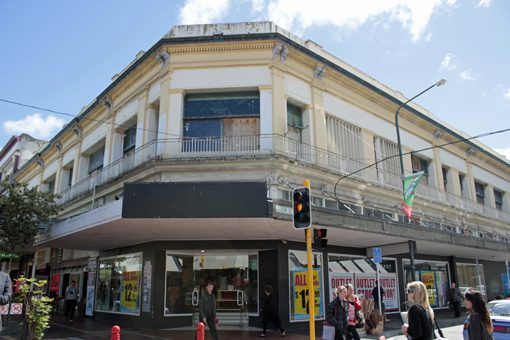 The building was orange stickered by council in October 2011 and will be re-strengthened in the next few months. 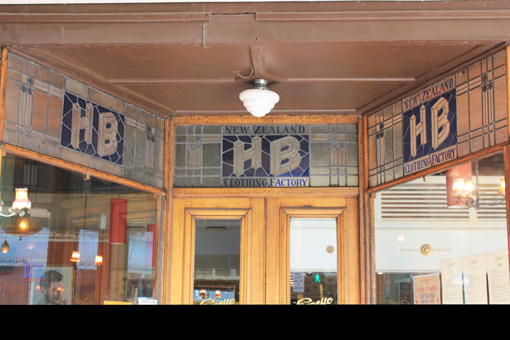 The HB clothing factory was established in the late 1880,s the HB stands for Hallenstiens Brothers they had store’s throughout the country. I think it is a shame that the building has had its leadlight windows removed, as these where a visual references to its past and a reminder of our cities commercial beginnings. In the 60’s and 70’s a shop located in this same building was Crazy Ricks. I knew the shop well in my youth as my theatrical buddy Phil Gordon’s dad Rick owned the store. We frequented the shop often after school before heading up the road to where they lived, a flat above another shop at the top of the street. My school bag was a canvas army surplus one, just a small example of NZ military remnants available to buy at Crazy Ricks. The store was full of all sorts of products, sunglasses, key rings, tin canteens, torches, camping gear etc. The store was also full of things made in Japan and Korea and cheaper than those available in the department stores of the day. Rick was before his time when it came to Asian imports and another of the memorable characters now gone from the street forever. Mucheners which also closed before Christmas was an institution for those in need of a burger having been in the street for 30 years. The burgers where created with good meat, spices and dedication and care for their customers. Even though I wasn’t familiar with the delights of this establishment, I know many people who talk of it fondly. The place will be missed by many particularly after a drinking session in the Street. Change is inevitable, but I hope that some of our built heritage is left, as it is an important part of the character of our city. 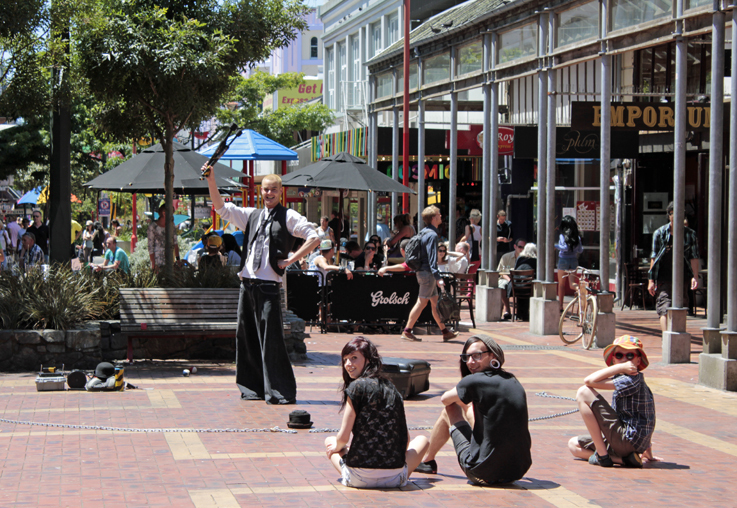 Theres nothing like a beautiful day in Wellington. 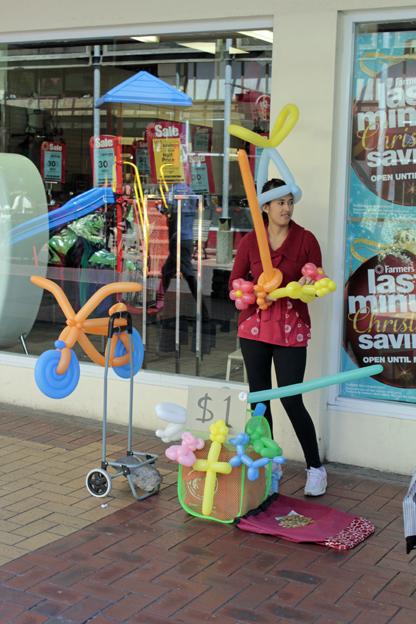 Cuba Mall was full of Christmas shoppers and students looking for entertainment and prezzys, they where rewarded with a number of colourful creatives touting their ware’s. 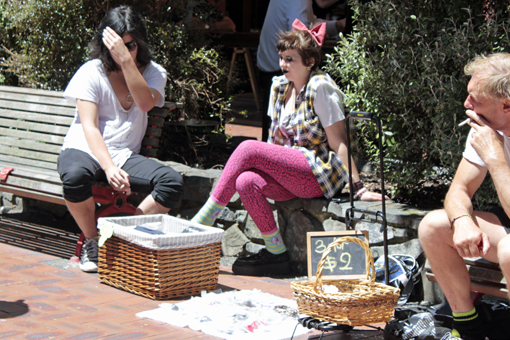 In my first post I posed the question, what is the future of Cuba St? For me answering this question involves understanding its past a little better. people, history and buildings being subjects that interest me. I have been cruising the Turnbull library online, what a great place for researchers and I think money well spent from our nations cultural budget. Years ago I wanted to find out about a house we bought on the Terrace which was built in the 1890’s. I ventured into a small 3rd floor room in the central city and was allowed to pull out numerous old wooden draws full of black and white photographs, fascinating early records of our city. That was a great tactile experience, but looking online is so much quicker! The library is now merged with the National library, currently undergoing a massive rebuild, more money well spent. Though I imagine that will be the last this institution will see of tax payers dollars for a while. The accessing of original records in the future I imagine will be surrounded in more archivist procedure, involving white gloves, paperwork and time getting the originals out from storage. I have been into another of our city’s great buildings the city library, skimming through a few books written about the city and enjoying my enlightenment. Anyone would think I was getting all academic, but I don’t think I could cope with the formal structure or the fee’s an institution would charge me. I am engaging in more of a stroll through Cuba Streets history, looking for info on the people who built the buildings and the residents and business people who lived and worked there, how the street came to have the character it does today. Back in 1840 the surveyors off the Cuba had a plan, it was drawn up in England, 1,100 plots to be balloted, but of course it didn’t fit! Drawn up in a square with the assumption that it was flat, drawn was also a river running through the middle, supposed to be a wide slow flowing navigable one. But in reality the land was steep with a small amount of flat land leading into the harbour. The large hill ( the Terrace ) and a ravine with a stream separated the two areas, the plots were squeezed into Thorndon and the Te Aro flat area which was much larger . 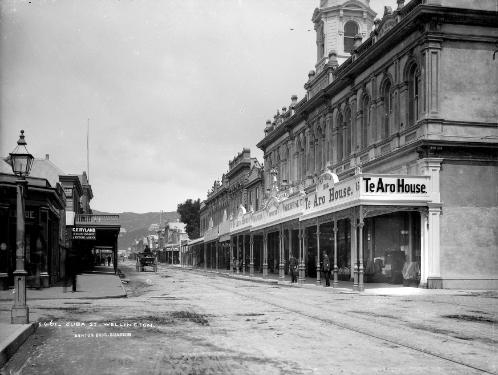 This was the beginning of that distinctive juxtaposition of the two ends of town, that still exists in Wellington today. Thorndon flats was described as the aristocratic end of town and Te Aro flats the more democratic community end. Where Stewart Dawson corner is now, was known as Windy Point, this point pre reclamations was the dividing line between the two community’s. It is noted that the boys from schools at either end of town, would challenge each other to fist fights at Windy Point. Funny that, I have always considered Willis St to be a dividing line between the Suits and the Bohemians. 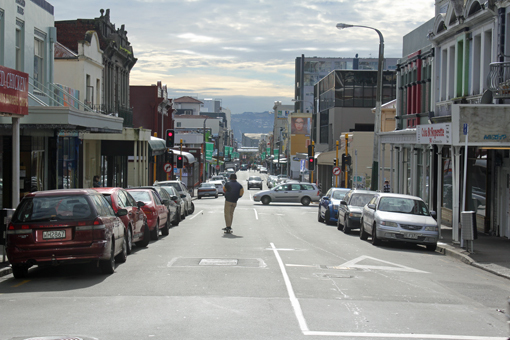 However the gentrification does seem to be moving at a rapid speed up towards Te Aro with Cuba St and its character being part of the attraction. Bellow courtesy of the Turnbull library Windy Point is that large rock jutting out on the left. My interest in Cuba St starts at its beginning, which is not that long ago when you consider the age of some streets in Europe. 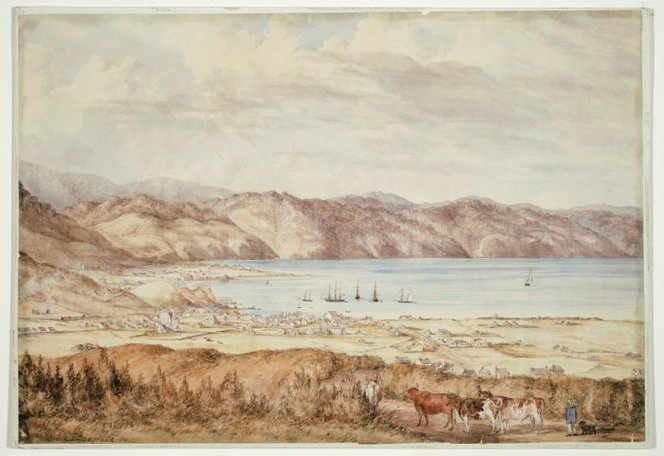 In November 1839 The New Zealand Company arrived in Wellington harbour with Englishman Colonel William Wakefield the skipper of the ship Tory, Wakefield was a member of a property developing family, involved in the establishment of settlements throughout NZ and Australia. One other ship accompanied him, the Cuba, on board where a bunch of land surveyors. Local whaler and trader Dicky Barrett ( remember Barrett’s Hotel on Lambton Quay? Gone now, I used to pull pints there in my student days) Dicky translated for Wakefield and a huge parcel of land stretching for miles around the harbour and up the Hutt Valley was bought from local Maori. This included land owned by Maori from Pito-one and Te Aro Pa’s. There where about 1,500 Maori living in the region in a number of Pa’s positioned around the harbour. These initial purchases became embroiled in controversy with some issues only now being rectified through the Waitangi Tribunal. All this initial land was purchased for the princely sum of $350 pounds worth of goods no cash just white mens idea of what the locals might want. the goods traded included red nightcaps, (picture that, the local iwi wearing cozy night caps!) blankets, soap, guns and ammunition, possibly some of this trade was useful, though it was commented on by circles back in England that the price paid to local Maori was a good buy! Just a few months later the Treaty of Waitangi was signed which stopped the NZ company in its tracks and made it illegal for Maori to sell their land to anyone other than the Crown. Whether this improved the price paid for their land is debatable. Te Aro Pa was on the waterfront located near what is now the bottom end of Cuba St. The Cuba boat load of surveyors carrying guns, took to their work with gusto, driving wooden survey pegs into the ground around the Pa and through their vegetable gardens. The local Maori where in disbelief that their land was being taken over and skirmishes occurred. It seems the chef that did the deal sold more than his own whanau’s land and included some of his neighbours as well. Just a few weeks after the purchase in 1839 nine boat loads of immigrants arrived Febuary 1840; These boats names are forever part of our city as Wellington Street names. The immigrants where eager to purchase land from the New Zealand Company as they had been enticed by the marketing hype back in the UK. The spin doctors of the NZ company boasted that the land in the new Colony post of Wellington had undulating plains suitable for growing grapevines, olives and wheat. A different reality all together really, a case of false advertising I reckon. 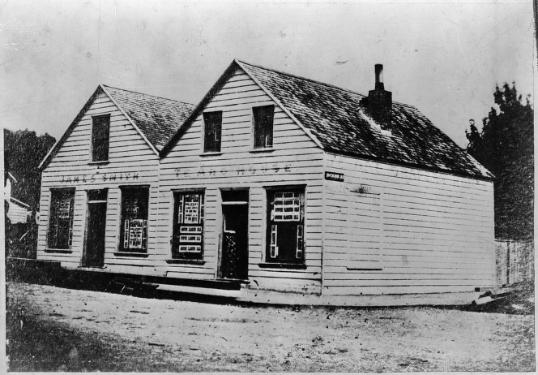 The history of the initial settlement of Wellington is full of stories about the wrongs of the settlers and the miss understandings with the local iwi and continues to be disputed to this day. 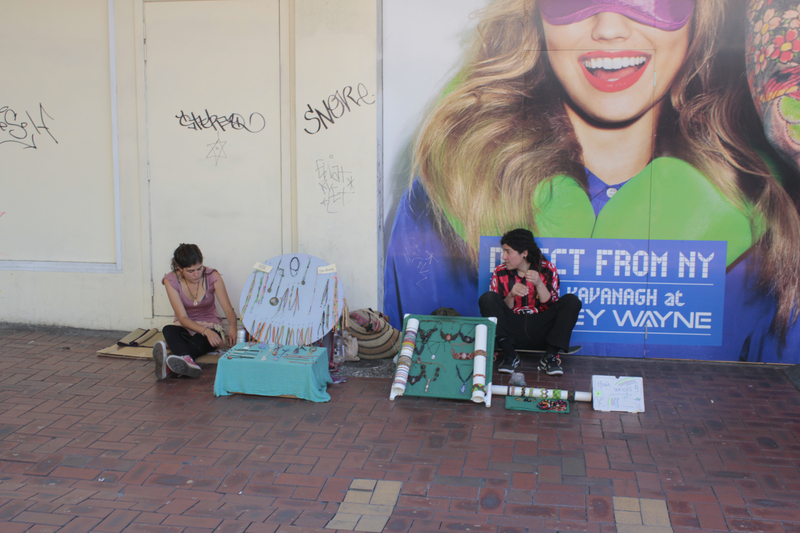 It’s a complex issue and as I am no expert I wont go into it to deeply, I just wanted to paint the picture of how Cuba St came to be. 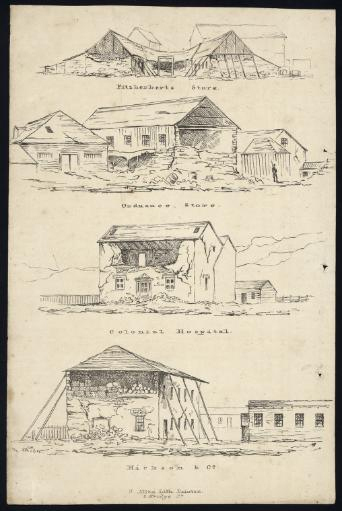 In February of this year the citizens of Christchurch were shaken to the core, their city centre was in ruins and many lives were lost. The historical buildings that made up a large part of the city’s character where now just rubble. After getting over the shock that this was happening in my country, to a city I knew so well, I started to realise that it could easily have been my city the character city of Wellington lying in ruin. It has always been thought that Wellington would be the city that would experience the big quake, a conversation I have heard all my life. As the country faces the reality of the loss of so many lives and the continuing financial burden for our citizens, many conversations are centering around the state of our buildings, modern and historical. 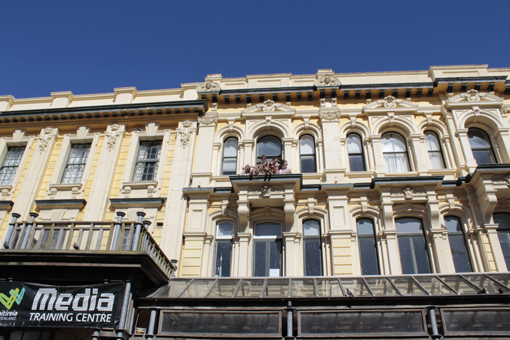 Wellington has many old buildings dating from the late 1800’s that are built of un-reinforced masonry similar to the many buildings that collapsed in Christchurch. Our local council has reacted as only a council does and bought forward time frames for buildings deemed as earthquake prone to be either restrengthened or demolished. This is necessary for the safety of people, however this will mean that parts of our city will change dramatically over the next decade. 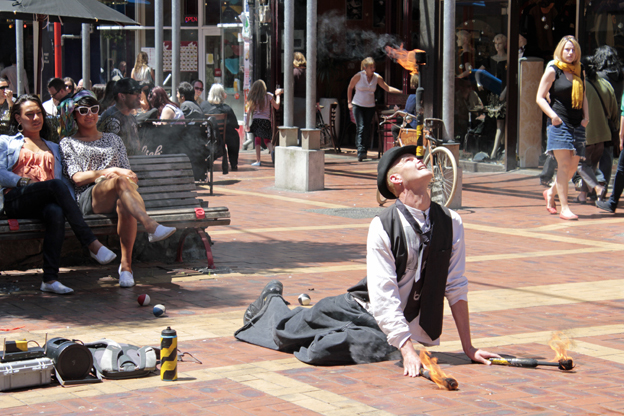 Cuba St is considered to be the creative capitals arterial vein. 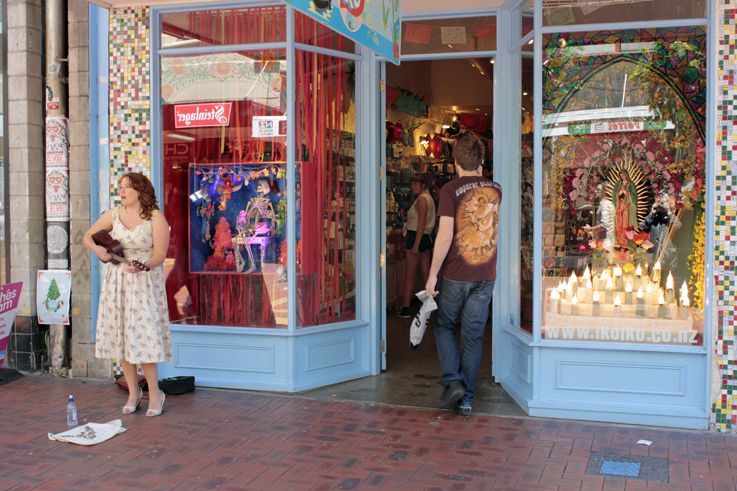 The people, buildings and urban community that is Cuba St is Bohemian. A street of cafes, bars, secondhand clothing stores, galleries, jewellers, shops and residential units. This historical street will be hugely effected by the demolition and refurbishment of the many earthquake prone buildings lining its straight but bent street. 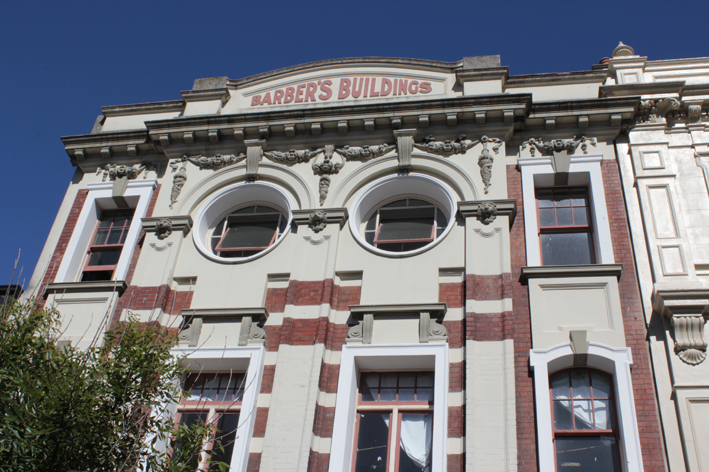 The prospect of the change that will occur in Cuba St during the next few years and my life long relationship with the street has inspired me to acknowledge its past through historical reasearch, photography, interviews and writing, starting with this blog. I want to encourage others to share their stories of the street as well as to consider its future.